Pebble is ready to launch the next generation smartwatch tomorrow and the company has also put up a timer on its homepage. Above the time is pixel-art of a pebble watch and no visible hints about the new smartwatch are easily visible. However, an image of the new Pebble smartwatch has been spotted on the official website and reveals the features that are expected. As reported earlier, the new Pebble smartwatch will be a major update. 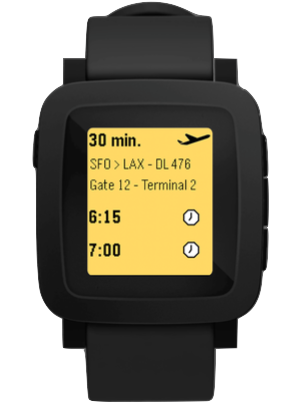 The available image points to a new color e-ink like display with notifications about flight times and alarms. Also, it is quite wider and stubbier than the current models. The team that built WebOS has designed the operating system of the new Pebble watch. We expect more fluid animations, watch faces and performance tweaks. It’s only a day until Pebble lifts the veil.